The first anniversary of the Potters Bar rail crash, which claimed the lives of seven people, will be marked with a service of commemoration on Saturday. Survivors of the crash will join victims' families for two memorial services. There will be a private service at a spot close to the crash site at the station, where a memorial garden will be dedicated. This service will include a period of silence at 1256 BST - the moment when the West Anglia Great Northern train was derailed. It will be led by the Archdeacon of Hertford, the Venerable Trevor Jones. The Assistant Bishop of St Albans, the Right Reverend Robin Smith will dedicate the garden. No trains will pass through Potters Bar during this time. There will also be a prayer led by Father Tim O'Connor, priest at Our Lady of Assumption Roman Catholic Church, whose worshippers included Agnes Quinlivan, 80, who died when she was hit by crash debris as she walked under the rail bridge. The garden, which includes a sculpture and a ring of ornamental pear trees, was paid for by the local community with £8,000 raised at a soccer match. On Saturday afternoon a public service of commemoration will be held at Mount Grace School, Potters Bar. Candles will be lit in memory of those who died. There will be seven candles in memory of the dead, and one each for the injured, the rescue services and the local community. Students from Mount Grace school in Church Road will bring a Tree of Life to the service. This will later be planted in the school grounds as a permanent memorial and dedicated by the Bishop of Hertford, the Right Reverend Christopher Foster. Seven people were killed and more than 70 injured when the rear coach of the train heading for King's Lynn in Norfolk derailed 150 yards south of the station. 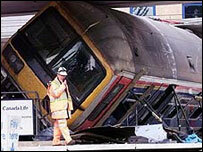 British Transport Police said a 28-strong team was still collating evidence in what has been called Operation Declare. 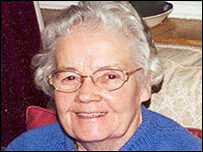 As well as Mrs Quinlivan, other victims included Austen Kark, 75, the husband of novelist Nina Bawden. Jonael Schickler, 25 fro East Sussex and Emma Knights, 25, from Cambridgeshire also died at the scene. As did Chia-hsin Lin, 29, and Taiwanese journalist Chia-Chin Wu, 30. Alexander Ogonwusi, 42 and from London died later in hospital.